In Australia, LP Gas cylinders require retesting every ten (10) years. 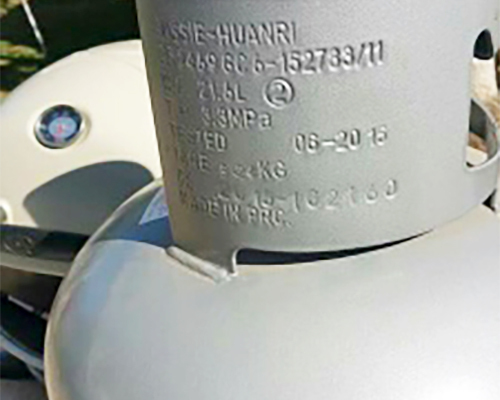 Gas bottles have a date stamp applied during manufacture. It is usually in the metal collar (as pictured) but can be on the base. It may also include the maker’s brand and country. The date normally comprises the month and last 2 digits of the year. Provided a bottle is free of damage, it may be refilled often during its first 10 years. A bottle older than 10 years, must be rigorously inspected before it can be refilled. The inspection must be done by a licensed tester. Once satisfied the bottle meets Government safety standards, the tester will re-stamp it for a further 10 years of refilling. For you, the owner of a gas cylinder which is empty and out of date, there is a dilemma. The simple solution is to take it to a Bunnings store and swap for a full one that is ‘in date’ … assuming there is a Bunnings nearby. Your next best options are Coles Express and Caltex Woolworths service stations. Beware the merchant (or local council) that charges a fee (often $10.00) to take an out-of-date bottle off your hands. If, as they claim, their supplier is charging them to salvage the bottle, go elsewhere. There are not many such scammers, but we hear of one now and again. Just as we hear of gas refillers who charge outlandish prices for gas bottle bungs. In several States it is against the law to transport gas bottles, full or empty, without a bung. We don’t argue with that. But we have heard of rogues charging up to $3.00 for these cheap bits of plastic. If you don’t have a bung, be sure to ask what the shop charges for one BEFORE they start the refill. In certain situations, owners of gas bottles don’t want to swap them. The reason for wanting to retain a bottle is usually its unique size, shape, special fittings, etc. Then there are stainless steel gas bottles for marine use. Would you want to swap a bottle that cost you several hundred dollars. And that is just for a 2 kg size! So you need to find a licensed gas bottle tester. Easier said than done! We spent hours researching this article. Could we find a website with a comprehensive list of Australia’s gas bottle testers? Not on your sweet Nellie! There isn’t one, but we did track down the SAI GLOBAL INFOSTORE. SAI GLOBAL is an organisation that collates and sells Australian Standards Data in book form. They wanted almost $200.00 for a book containing a list of gas bottle testers. But how could we be sure the data was current? Would you hand over $200.00 for a book last updated in 2008! “Could we at least look at it before we purchased”, we asked? 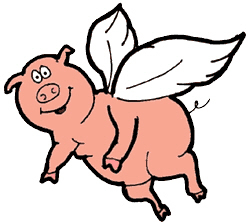 Yeah sure … pigs might fly! It’s your safety that’s at stake, but do bureaucrats make it easy or cheap for you to comply with their regulations? No way! So with your help, we will create our own database list, as we have done with refill and swap locations. To add a licensed gas bottle tester to our list, send details here. To look at the list (such as it is, as at 01/05/17) click here.